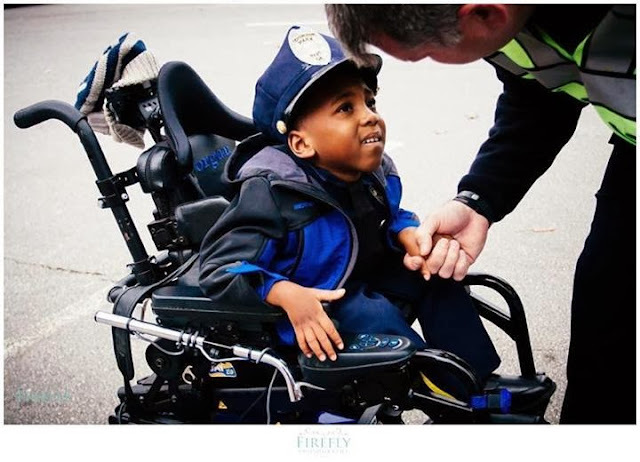 When 11Alive aired the story of Morgan Steward, a five year old whose dream is becoming a police officer, hundreds of people told the station that they wanted to do “something bigger”. Morgan suffers from SMA type 2, a condition that causes muscle weakness and respiratory failure. Morgan's dream is to become a police officer and on Tuesday, December 17th from 10:00am-1:00pm hundreds of happy souls are taking over Covington for #OfficerMorgan Day. 1. Sign up on (http://www.11alive.com/news/article/315414/40/Sign-up-to-Volunteer-for-OfficerMorgan-Day) to Volunteer. Keep an eye out for an email explaining where you can report for duty Tuesday, December 17th from 11 Alive. 2. Make signs with messages of support for "Officer Morgan". 4. Share this link. Get your friends, families, and community groups to participate. 5. Spread the buzz. Use the hastag #OfficerMorgan on Facebook and Twitter.